Donald Glover is way into using entertainment to get across a political message. At least it seems that way with his latest project, a short film co-starring Rihanna. 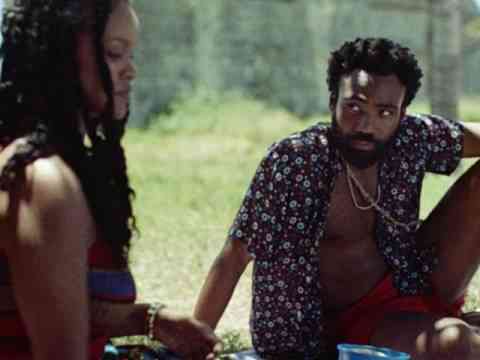 "Guava Island" debuted on Amazon Prime's streaming service after Glover headlined at Coachella Friday as his alter ego, Childish Gambino. The 55-minute breezy thriller stars Glover as Deni Maroon, a musician who toils as a dock worker for resident bad guy Red Cargo (portrayed by "Game of Thrones" actor Nonso Anozie) on the lush Guava Island. Rihanna plays Deni's girlfriend, Kofi Novia, a factory worker who also works for Red Cargo and whom Deni lovingly serenades in parts of the film. Everyone on the island is under the thumb of Red Cargo and when one of Deni's fellow workers dreams of leaving to go to the United States to open his own business, Deni snickers. "This is America, Guava's no different than any other country," Deni says. "America is a concept. Anywhere where in order to get rich, you have to make someone else richer is America." Glover then launches into his song "This Is America," which is as political as it gets. What follows is as much about capitalism and art as it is a rom-com tracing the love story of Deni and Kofi. There is plenty of music, especially given that Deni wants to throw a music festival on the island that Red Cargo is staunchly against because it will take the island residents away from their work duties, but surprisingly -- or perhaps, strategically -- no singing by Rihanna. Filmed in Cuba, the top-secret project was written by Glover's brother, Stephen Glover, and directed by by Hiro Murai. Both men also work with Glover on his hit FX comedy series "Atlanta," and Murai directed the music video for "This Is America." It had been highly anticipated for months and the Twitter response was mostly positive.